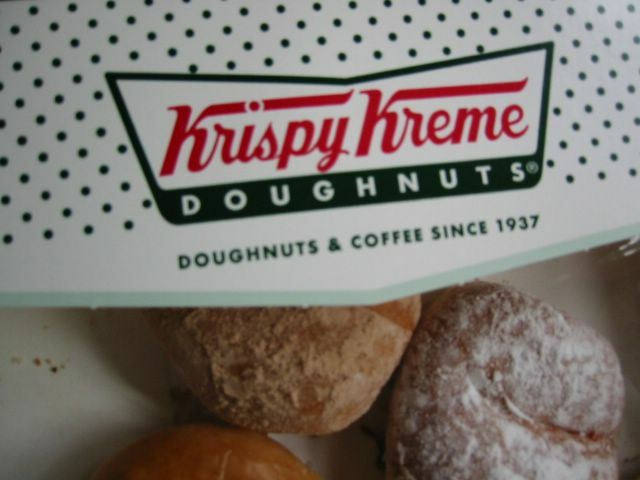 Krispy Kreme doughnuts has arrived in the UK! A box was bought in London Victoria by Dennis for us when he came for a visit recently. I was eager to try it since I have heard that people in US, Canada, and the Phils. were braving long queues just to get hold of one of these. Well, as I was munching it I thought "what's the fuss all about?". If my memory serves me right it tastes like Dunkin Donuts, doesn't it? Even the variety of flavours are much like what they have in DD. They don't even have my favourite one - what was it called? It's got a cake like dough, cinnamon flavour but shaped like a round donut with a hole. If you know what it is kindly leave a comment here. And please enlighten me on why Krispy Kreme is so coveted. I'm beginning to think it's all hype. 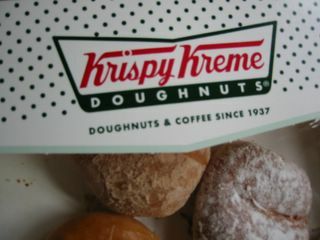 Krispy Kreme Doughnuts taste out-of-this world good if bought fresh from their bakery outlets..nothing can compare. The fresh ones out of a box are also great if their heating procedures are followed. Many thanks, and, hat's off to you for your dedication to this project!